The previous articles on the gods have given a general idea of some of the ways the gods were are perceived, and have given some bits and pieces on lore and the like. There’s a lot more ground that can be covered, so to speak, that can help us get a better understanding of what we’re looking at. This article will cover a variety of different areas – the sources we can look to in forming a picture of the gods, and the possibe problems inherent with them, and, whether or not we’re dealing with gods at all. Unfortunately this article didn’t fit on one page, so I’ve had to split it into two parts. The second part covers the question of what to call them, and the issues surrounding Danu – some of which is covered in Alexei Kondratiev’s article Danu and Bile – Primordial Parents? which is well worth a read. One of the most obvious places to look, if we want to get an idea about the gods, are the myths and lore of Ireland, Scotland and Man. These are the stories that tell us about the gods, and their place in the mythological landscape. Some of the stories are old, and some are relatively new, but they can tell us a lot about the character of the gods. We see where they lived, who they loved, the places they went, and even the places they created or lent their names to in other ways. Many of these associations survive today as well. Given the nature of the sources we’re looking at, however – particularly the medieval sources, written by scribes who often had their own agendas – it is difficult to tell from these sources alone just how far back these associations go. Sometimes the associations might be genuinely pre-Christian, whereas (as we’ve seen) other times we can see that old gods are adopted for more modern political purposes.1 Even then, what we are seeing there is arguably a continuum of belief, if not something that is still in a pre-Christian context. River and mountain names tend to be less likely to change than the names of towns, villages, and political identifiers, because it is often more important to know who a certain town or area belongs to than a particular mountain or river. 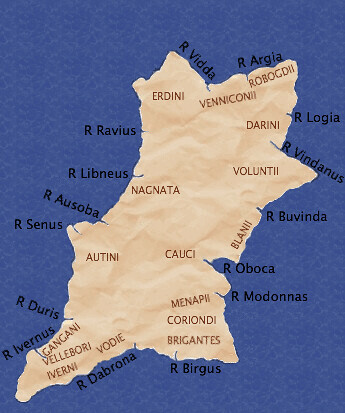 Politics and culture may change, but by and large the landscape stays the same – relatively speaking, at least.2 In some cases, the gods lend their names to a place or feature in the landscape, and sometimes we can see a marked continuity of deities being associated with particular places as far back as our sources go. It is with these glimpses that we get our earliest snapshots of the gods, even if the names alone don’t tell us much else. These glimpses are the earliest evidence we have of tribes and deities in the Irish landscape, and in many cases we see that the associations survive into the present day. Other associations have been lost, or may be difficult to discern given the problems with Ptolemy’s reliability; that we can recognise certain names as having modern renderings, gives us some confidence that Ptolemy can be relied on at least tentatively. Ptolemy’s map throws up some other important points, especially in the case of the Brigantes. A ‘cognate’ indicates two words (or more) from different languages that share common origins – words that ultimately come from the same root, and so share similar meanings. This may suggest that some deities found their way to Ireland by way of Celtic settlers (or indeed invaders) from the continent or the Brythonic Brigantes tribe who inhabited northern England, or that the Irish named their gods on the same principles as their Celtic neighbours did (i.e. naming them after similar properties, like ‘shining’, ‘bright’, or ‘high’ that would result in similar names being found across a wide area that identified as Celtic at some point or other). In each place they are seen to be worshipped and regarded within their specific cultural contexts, and so what we see of the gods in Ireland – their stories, associations, their descendants – cannot be regarded as being the same, or necessarily applicable, elsewhere. Therefore, Lug of Ireland isn’t the same as Lugus of Gaul, and Brigit of Ireland isn’t the same Brigantia of the north-east of England, because in spite of the similarities of name and perhaps even function and origins, they are seen through different cultural lenses and were historically worshipped in different cultural and linguistic contexts. The myths show the gods as distinct entities, with their own characters and personalities. They are not shown to be facets of something bigger, they are as real and diverse as human beings are. While the origin legends bear memories of several invasions to the island – whether that should be taken as a literal invasion of people, or ideological, in the sense of ideas being spread more than people – and some of the gods may have had their origins outside of Ireland, or spread wider than the place of their origin, at least, whether that was Ireland or not – the myths and literature clearly show them to be Irish. No matter the mechanism of how they got there, they are seen to be a part of the land, and rightfully so. There is no getting around the fact that we do not have any sources from the pre-Christian Irish themselves that tell us anything explicit about the gods. The evidence is either contemporary, but from a foreign source – such as Ptolemy’s map, as we’ve already seen – or it is Christian in date, and either native or from foreign sources, but outside any sort of pre-Christian context. Mostly it was the second option that was taken – that is, the repainting and reinventing of pre-Christian deities within a particularly Christian worldview – immortal gods become mortal, supernatural beings at best. Others might be seen as maybe not good Christians themselves, but not strictly agents of the devil, or explicitly non-Christian in any other way, either.18 This process is both an advantage and disadvantage to us; it means that the stories of the gods survived, at least. But it also resulted in changes that sometimes conflict with and contradict pre-Christian beliefs, or else we may not be able to see exactly what is the result of this process of ‘demotion’, and what is genuinely pre-Christian in origin. Otherwise, there is evidence of demonisation of some deities as well – not so much in the myths themselves, but elsewhere. An Irish gloss in a Bible text explains the word lamia (a queen who became a child-eating demon) as “Monstrum in femine figura .i. Mórrígan.” Cormac also has a go, equating gúdeman – “fraudulent evil spirits” with uatha ocus morrignae – “spectres and mórrígans.”23 In the case of the Morrígan, it might be argued that her fearsome reputation in battle made an easy fit as a gúdeman, rather than simply a supernatural figure. Or, perhaps, we might consider that Cormac is referring to something that was a genuine tradition, even in pre-Christian times. Given the fact that some tales may only survive in late forms, it’s possible that some gods may have been ‘demoted’ from deity to supernatural entity/mortal so completely that it’s hard to tell whether or not they were originally gods at all. Or else the ambiguity may have been deliberate – Cú Chulainn, for example, may or may not be considered to be a demi-god given his divine parentage (Lug being his divine father), depending on who you ask, while Medb clearly bears the mark of a sovereignty goddess but is never explicitly said to be so. Medb in particular is a difficult case to prove conclusively one way or another. On the other hand, though, naming a place marks out its form and function, in a way becoming an act of creation itself – either creating its form or function, or confirming it; creating order and meaning to the world around you, defining it terms that are understandable.29 This place may be where the deity is honoured, and the place is set aside as ‘other’, not to be used for everyday purposes, but for fairs and festivals at certain times of the year like Lùnastal. These places are often remarkable in some way – high up, a lake, prehistoric mounds or stones, the source of a river, or perhaps a particular well that is associated with certain properties (general healing, curing infertility or madness etc), and we see that many mountains and high places especially are named after deities, and said to be their homes. This makes sense, as Mac Cana points out, because “the association of physical elevation with sacred transcendence underlies religious thought throughout the world, and is well attested among the Celtic peoples.”30 The term ‘Dindshenchas‘ itself comes from two words – senchas, meaning ‘knowledge of all that pertains to earlier times’, and dind, which can mean several things – ‘height, hill,’ ‘stronghold,’ or ‘famous or important place.’31 These high places are not necessarily special because they’re high, and therefore closer to the gods up in heaven (or other, similar concepts), but because they are themselves sheltered and set away from normal, everyday activities and settlements (but often otherwise exposed and open to the elements), whilst providing good views of the area that the deity – and the people/tribe – is said to be associated with. Often, however, the gods are described as beautiful and of fair hair and complexion, well-dressed and tall; any references to the contrary are generally an indication of their state at the time – the sovereignty appears as a hag because she has no rightful ruler beside her and is in a state of imbalance; the Dagda appears to be uncouth and wearing ill-fitting clothes that barely cover him adequately in one episode of Cath Maige Tuired because he has been forced to eat an enormous amount of porridge by the Fomorians, so as not to offend their hospitality (as they had hoped), and so has been wronged.48 He eats the porridge and beats them at their own game, but at something of cost to his dignity. Looking at how they behave in the myths, and then comparing it to our list to see if the picture fits can help us gain some confidence in assigning to divinity to some of the more ambiguous figures of the mythology. Their names also tend to give us handy hints – Medb, meaning ‘intoxicating one’, and relating to the root word for ‘mead’, referring to the libation given to a king at his inauguration, indicates her associations with sovereignty and is one of the main reasons many academics identify her as divine rather than simply mythological;50 or the Dagda, generally accepted as meaning ‘the Good God,’ and so on. Twice, then, Ána (Anu) is mentioned as a goddess by Cormac, and she gets a longer entry in Coir Anmann, ‘The Fitness of Names,’ where we are told that she was worshipped as a goddess of prosperity in the province of Munster.58 Elsewhere, she is simply equated with Ireland itself, – “Anann I.i Eireann. ‘Ireland.’”59 Or: “Anann of Ana (i.e. of abundance), i.e. Ireland, ut est ‘a casting-up against the and of Erin (Anu), i.e. a goddess, (cast-up), i.e. knowledge to poets.”60 This appears to be referring to an Old Irish poem, ‘Ail tighe tres filidecht’, which has the line brútaidh fri híath nAnann, ‘bursts against the land of Anu.’61 This and the reference by Cormac to her being ‘mother of the Irish gods’ is significant, and something we will come back to later. Another charm from the same source calls on Goibniu to remove a ‘thorn’, calling on his association with sharp metal objects to remove something sharp from the flesh.67 Clearly during Cormac’s time, pre-Christian influences were close to the surface. Clearly this is referring to Áine, who lends her name to Cnoc Áine (Knockainy) and is the ancestral deity of some septs of the Eoganacht in Munster, but here she isn’t named as such. That she’s mentioned at all might be seen as some way of giving a hint, though. It seems that their stubborn association with the arts is one of the reasons they remained so popular, even if they didn’t sit so comfortably in a Christian world view. A contradiction though it may have been, such fine praise poetry, and such fine reliquaries and other crafts that exalted God and those who were holy, ultimately had their source from the gods…(?) No wonder there was some discomfort as to how to approach them, portray them, and even to refer to them. 1 Lysaght, The Banshee: The Irish Supernatural Death Messenger, 1986, p195. 2 The large majority of prehistoric monuments of pre-Celtic Ireland, and any associations in the landscape appear to have been throughly co-opted into a Celtic worldview over time, with places like Brugh na Boinne, Loughcrew, Knowth, Dowth, Dun Ailinne, and so on, all being expressed in thoroughly Celticised, Irish mythological terms, of course. Likewise, many of these places with pre-Christian associations have subsequently been co-opted into a Christian landscape as well – wells in particular. Mac Cana, Placenames and Mythology in Irish Tradition: Places, Pilgrimages and Things, in Proceedings of the First North American Congress of Celtic Studies 1986, 1988, p338. 3 O’Rahilly, Early Irish History and Mythology, 1946, p1. 4 Adapted from the open domain image of Ptolemy’s map of Ireland on Wikimedia. I’ve simplified the map, leaving out the placenames to avoid over-cluttering. 5 O’Rahilly, Early Irish History and Mythology, 1946, p3. 6 Byrne, Irish Kings and High-Kings, 2001, p231. 7 O’Rahilly, Early Irish History and Mythology, 1946, p3-9. 8 Koch, Encyclopedia of Celtic Culture, 2006, p1471; 1707. 9 Koch, Encyclopedia of Celtic Culture, 2006, p287-288; p1695. 10 Ó hÓgáin, The Lore of Ireland, 2006, p26, p277, p329; Koch, Encyclopedia of Celtic Culture, 2006, p1695. 11 O’ Rahilly, Koch, Encyclopedia of Celtic Culture, 2006, p749; O’Rahilly, Early Irish History and Mythology, 1946, p56. 12 Mac Cana, ‘Placenames and Mythology in Irish Tradition: Places, Pilgrimages and Things,’ in Proceedings of the First North American Congress of Celtic Studies 1986, 1988, p338. 14 See for example: MacNeill and Shaw, Tales until dawn: the world of a Cape Breton Gaelic story-teller, 1987. Examples are also given in Wright-Popescul, The Twelve Winds of the Ancient Gaelic World, 1997. 15 As Mac Cana puts it: “To get to know the features of one’s environment and their names is to form an indissoluble association with them, amounting at times almost to a kind of empathy.” This is why learning the stories and origins of places and deities is so imperative, as is connecting to the land around you as well. Mac Cana, ‘Placenames and Mythology in Irish Tradition: Places, Pilgrimages and Things,’ in Proceedings of the First North American Congress of Celtic Studies 1986, 1988, p341. An example of Gaelic placenames and speakers outside of Scotland or Ireland can be found here. 16 See Bennett, The last stronghold: Scottish Gaelic traditions of Newfoundland, 1989; Rieti, ‘ “The Blast” in Newfoundland Fairy Tradition, in Narváez, The Good People: New Fairylore Essays, 1997. 17 Herbert, ‘Transmutations of an Irish Goddess,’ in Billington and Green (Eds. ), The Concept of the Goddess, 1996, p148. 18 O’Rahilly, Early Irish History and Mythology, 1946, p261. O’Rahilly refers to this process as ‘euhemerism’, “treating…divine beings as if they were men of a far-off age,” and so “By thus humanizing and mortalizing the divinities of pagan Ireland, they hoped to eradicate the pagan beliefs that still lingered on among many of their countrymen.” Following this (and having learned the term used in such a manner during my studies) I initially used the term in this article, but in fact the term means quite the opposite. As a result, in spite of its popular usage in many Celtic books to convey the meaning that O’ Rahilly gives (as an example), I’ve opted to remove the word and, for lack of a better alternative at the moment, have opted for ‘demoting’ where necessary – the quote marks, I hope, will serve as a reminder that this is a for-lack-of-a-better-term word than anything exact. 19 MacQuarrie, The Waves of Manannán, 1997, p165. 20 MacQuarrie, The Waves of Manannán, 1997, p165. 21 Stokes, Coir Anmann in Irische Texte III, 1898, p357. 22 MacQuarrie, The Waves of Manannán, 1997, p165. 23 Herbert, ‘Transmutations of an Irish Goddess,’ in Billington and Green (Eds. ), The Concept of the Goddess, 1996, p148. 24 Sjoestedt (trans. Myles Dillon), Celtic Gods and Heroes, 1949, p25; Clark, The Great Queens: Irish Goddesses from the Morrígan to Cathleen ní Houlihan, 1991, p191. 25 Koch, Encyclopedia of Celtic Culture, 2006, p1696. 26 Herbert, ‘Transmutations of an Irish Goddess,’ in Billington and Green, Concept of the Goddess, 1996, p143. 27 Cath Maige Tuired, 84. 28 Sjoestedt (trans. Myles Dillon), Celtic Gods and Heroes, 1949, p1. See also: Mac Cana, Placenames and Mythology in Irish Tradition: Places, Pilgrimages and Things,’ in Proceedings of the First North American Congress of Celtic Studies 1986, 1988, p333. 29 Mac Cana, Placenames and Mythology in Irish Tradition: Places, Pilgrimages and Things,’ in Proceedings of the First North American Congress of Celtic Studies 1986, 1988, p321. 30 Mac Cana, Placenames and Mythology in Irish Tradition: Places, Pilgrimages and Things,’ in Proceedings of the First North American Congress of Celtic Studies 1986, 1988, p323. 31 Mac Cana, Placenames and Mythology in Irish Tradition: Places, Pilgrimages and Things,’ in Proceedings of the First North American Congress of Celtic Studies 1986, 1988, p333. 32 Lysaght, ‘Traditions of the Banshee,’ in Billington and Green, Concept of the Goddess, 1996, p159. 33 Cath Maige Tuired, 84. 35 Clark, The Great Queens: Irish Goddesses from the Morrígan to Cathleen ní Houlihan, 1991, p24-25 and p209-210. 36 Lysaght, ‘Traditions of the Banshee,’ in Billington and Green, Concept of the Goddess, 1996, p154; Ó hÓgáin, The Lore of Ireland: An Encyclopedia of Myth, Legend and Romance, 2006, p27-28. For an in-depth study of the Banshee, see Lysaght, The Banshee. 37 Ó hÓgáin, The Lore of Ireland, 2006, p329. 38 MacNeill, The Festival of Lughnasa, 1962, p201-206. 39 See Bride and the Cailleach. 40 Hull, ‘De Gabail in t-Sida’ in ZcP Volume 19, 1933, p57. 41 Evans-Wentz, The Fairy-Faith in Celtic Countries, 1911, p291. 42 Wood-Martin, Traces of the Elder Faiths of Ireland Volume I, 1902, p372. 43 Kelly, A Guide to Early Irish Law, 1988, p18. See the section on Sovereignty in the Talam article. 44 See Tymoczko, ‘Unity and Duality? A Theoretical Perspective on the Ambivalence of Celtic Goddesses,’ in Proceedings of the Harvard Celtic Colloquium Volume V, 1985, p30. 45 Epstein, “Gods in the Hood”, in Proceeding of the Harvard Celtic Colloquium Volume XIV, 1997, p96. 46 See Murray, The Whirlpool of Corryvreckan, 1950. Some fantastic bits of lore here. 47 Ó Crualaoich, The book of the Cailleach: stories of the wise-woman healer, 2003, p39; p209. 48 Gray, “Cath Maige Tuired: Myth and Structure (84 – 93)” in Éigse XIX, 1983, p232. 49 Koch, Encyclopedia of Celtic Culture, 2006, p586. 50 McCone, Pagan Past and Christian Present in Early Irish Literature, 1990, p109; Clark, The Great Queens: Irish Goddesses from the Morrígan to Cathleen ní Houlihan, 1991, p126; Sessle, ‘Misogyny and Medb: Approaching Medb with Feminist Criticism,’ in Mallory and Stockman (Eds. ), Ulidia, 1994, p137; Rees and Rees, Celtic Heritage, 1961, p75-76. See Marriage: Part One. 51 O’Rahilly, Early Irish History and Mythology, 1946, p261. 53 Koch, Encyclopedia of Celtic Culture, 2006, p830. 54 Macalister, Lebor Gabála Érenn Book IV, 1941, p137; cf p341. 55 Stokes and O’Donovan, Sanas Chormaic, Cormac’s Glossary, 1868, p19; p23. 56 Stokes and O’Donovan, Sanas Chormaic, Cormac’s Glossary, 1868, p4. 57 Stokes and O’Donovan, Sanas Chormaic, Cormac’s Glossary, 1868, p17. 58 Stokes, ‘Coir Anmann,’ in Irische Texte III, 1898, p289. 59 Miller, ‘O’Clery’s Glossary,’ Revue Celtique IV, 1879-1880, p366. 60 Stokes and Meyer, ‘O’ Davoren’s Glossary,’ in Archiv für Celtische Lexikographie, 1904, p204. 61 Carey, ‘Notes on the Irish War Goddess,’ in Éigse, p270. 62 Stokes and O’Donovan, Sanas Chormaic, Cormac’s Glossary, 1868, p23. 63 Stokes and O’Donovan, Sanas Chormaic, Cormac’s Glossary, 1868, p56. 64 “Dian-cecht the name of Erin’s sage of leechcraft, ‘the god of the powers’, for cecht means ‘power’.” Stokes, ‘Coir Anmann’ in Irische Texte III, 1898, p357. 65 Cath Maige Tuired, 33. 66 Stokes and Strachan, Thesaurus Paleohibernicus Volume II, 1903, p249. 67 Stokes and Strachan, Thesaurus Paleohibernicus Volume II, 1903, p248. 68 Stokes and O’Donovan, Sanas Chormaic, Cormac’s Glossary, 1868, p122. 69 Stokes and O’Donovan, Sanas Chormaic, Cormac’s Glossary, 1868, p47. 70 Stokes and O’Donovan, Sanas Chormaic, Cormac’s Glossary, 1868, p144. 71 Stokes, ‘Coir Anmann’ in Irische Texte III, 1898, p355. 72 Cath Maige Tuired, 81; Sjoestedt (trans. Myles Dillon), Celtic Gods and Heroes, 1949, p38. 73 Stokes and O’Donovan, Sanas Chormaic, Cormac’s Glossary, 1868, p9. 74 O’Rahilly, Early Irish History and Mythology, 1946, p261. 75 Macalister, Lebor Gabála Érenn Volume IV, 1941, p169. 76 Carey, Scél Tuáin Meic Chairill, in Koch and Carey, The Celtic Heroic Age, 1995, p212. 77 Evans-Wentz, The Fairy-Faith in Celtic Countries, 1911, p67. 78 Macalister, Lebor Gabála Érenn Volume IV, 1941, p203.